Displaying ads on social media expands your marketing reach. Use our ad builder to create ads for Facebook and Instagram. You can choose what audience you’d like to target, including your own contacts, social media users whose interests align with your services or products, or people who visited your company’s website. We’ll help you create, buy, and run ads on both channels. In this article, you'll learn how to create, design, and post an ad to separate audiences through Mailchimp. You can run your ad on Facebook, Instagram, or both. To advertise on Instagram, you'll first need to link an Instagram business profile to your Facebook page. You'll need Admin user permissions on your Facebook Page to post an ad through Mailchimp. Mailchimp's Facebook ads have a unique billing system. You'll set your budget and purchase your ad up front. We'll only charge you for your ad's total clicks, and we'll credit back any unused budget. If your Instagram or Facebook ad doesn't fit Facebook's ad requirements, Facebook can reject your ad. Please disable ad blockers in your web browser to make sure Mailchimp's Ad Builder runs smoothly. Facebook and Instagram retargeting ads are available to Monthly and Pro users. If you want to use a landing page in a retargeting ad, make sure to accept our additional terms on your landing page’s Settings and Tracking section. You’ll only need to accept the terms one time. Ready to create an ad through Mailchimp? You'll connect to Facebook, then move through the steps of our Ad Builder: Channel, Audience, Budget, and Content. First, you'll connect your account to Facebook and name your ad. To start your ad, follow these steps. Enter a name for your ad and click Begin. In the Facebook page section, click Connect Facebook. Remember, you'll need to be an Admin on the Facebook page you connect. Input your Facebook login credentials and click Log in. We'll take you back to the Ad Builder. Click the Change page drop-down menu, and choose the page of the business you want to promote. Toggle the sliders to choose your ad channel: Facebook, Instagram, or both. To advertise on Instagram, your Facebook page must be connected to an Instagram account. If you want to refine your ad's placement, click Edit to choose placement in the News Feed, Audience Network, or both. After you connect Facebook, choose who you’d like to target on the Audience step. You can target contacts from a list or segment, people with interests similar to your list contacts, or people with interests you define. You’ll also have the option to target people who have liked your Facebook Page, or people similar to your Facebook Page likes. If you’re a Monthly and Pro user, you can also create retargeting ads for people who have visited your website or landing page. To choose an audience, follow these steps. In the Audience step of the Ad Builder, click Edit Audience. Choose the audience you want to target: New people, Contacts, Custom audience, or Website visitors. Make additional selections to refine your audience. Options will vary based on the audience type you chose in Step 2. Show your ad to people who are similar to your list, or similar to your Facebook Page likes. Choose a country, then refine by audience location, gender, age range, or interest keywords. You can also include your list contacts, or your Facebook Page likes. Use a combination of location, gender, age range, or interest keywords to create a custom audience for your ad. 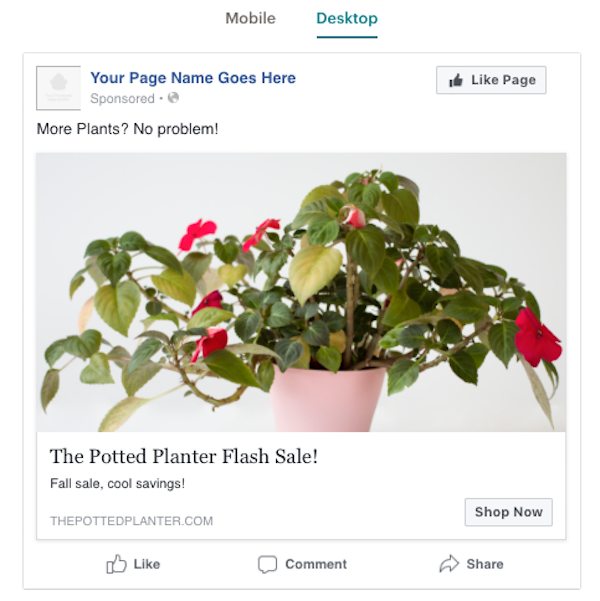 Use Facebook and Instagram retargeting ads to reconnect with potential customers who visited your site or landing page. Currently, this is available for Monthly and Pro Mailchimp accounts. Note: Try not to make your audience too narrow. If Facebook determines that your audience size is too small, they will reject your ad on either platform. For targeting a list, you'll need a minimum of 100. For targeting a lookalike audience, your audience should have at least 500 contacts. For retargeting ads, your website will need to have at least 1,000 visitors that are also Facebook users. 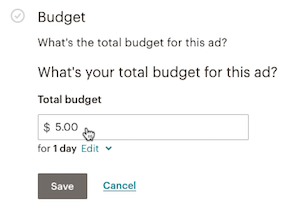 Now it's time to move on to the Budget step of the Ad Builder, where you'll set your ad's schedule and total budget. To set your budget and choose your ad's schedule, follow these steps. In the Budget step of the Ad Builder, click Edit Budget. Enter your total budget for the ad. Click Edit to set the duration of your ad. The minimum budget is $5 per day. You can choose to run your ad for a day, a week, 2 weeks, a month, or a specific duration. And now comes the fun part! It's time to design your ad in the Content step of our Ad Builder. You can create a simple ad with one GIF or static image, or a carousel ad that scrolls through multiple images and their own calls to action. To design your Facebook ad, follow these steps. 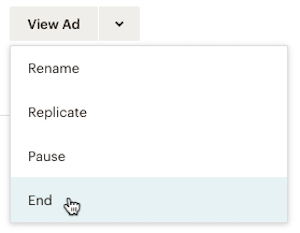 In the Content step of the Ad Builder, click Add Content. In the Message section, type a brief message for your ad viewers. Place your cursor on the Insert an image block, and click Browse Images to open the Content Manager. Choose an image or upload your image to the Content Manager, and click Insert. Here are some things to keep in mind when you choose your GIF or static image. Image dimensions must be at least 600 x 315px for Facebook and 600 x 600px for Instagram. Maximum file size is 8MB for GIFs and 10MB for static images. Aspect ratio must be between 9:16 to 16:9 for Facebook and 4:5 to 1.9:1 for Instagram. GIF ads should be 15 seconds or shorter. In the Link to field, type the URL where you want your ad viewers to go. Be sure to avoid using a Facebook page for this field, since this will cause an ad rejection. In the Title field, type a short headline for your ad. 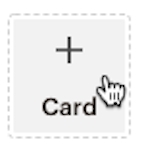 Use the Button drop-down menu to choose a call to action. Choose No button to omit the call to action. In the Description field, type some copy you want to appear as your offer. 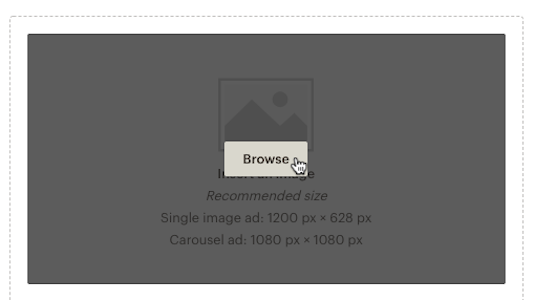 Optional: click Add Card, and repeat steps 2-8 to create a carousel ad with up to 5 different images. Right away, you'll see a preview of your ad. This is your last chance to review and edit your ad to make sure it's ready for Facebook and Instagram users! Click Edit Content to make any final changes. After your content is designed and reviewed, it's time to submit! To submit your ad, follow these steps. Confirm or enter your billing information in the sidebar, and enter your CVV. Click Submit Ad at the top of the Ad Builder, and then click Confirm Order. After you confirm the ad, we'll send it to Facebook for review, and email you when the ad is approved and posted to Facebook or Instagram. Keep in mind that Facebook has the right to reject any ad for a number of reasons. Instagram is owned by Facebook, so ads on their network are subject to Facebook's ad policies, too. We'll let you know if your ad is rejected so you can update or resubmit it later. Your ad budget will only be debited when the ad is approved and you start getting views on social media. 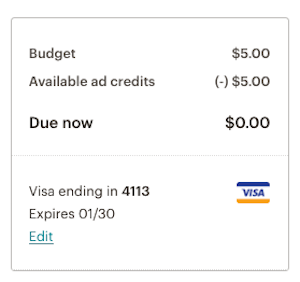 If your entire budget isn't used, you can resubmit the ad or have Mailchimp credit the remainder to your account so you can purchase another ad. Approximately 24 hours after your ad begins running, you'll see daily results on the Reports page of your Mailchimp account. Click the name of your ad to view important statistics like clicks, reach, impressions, and more. After your ad is submitted and approved, it will publish on social media at your scheduled time. However, you have the option to pause or cancel the ad if needed, which will remove it from Facebook and Instagram. If you want to temporarily remove your ad from social media, you can pause it. Paused ads can't be edited, but they can be turned back on later. To pause an ad, follow these steps. Click the drop-down menu next to the ad you want to work with, and choose Pause. Your paused ad will be removed from social media until you decide to resume it. 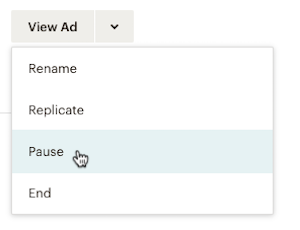 To resume a paused ad, go to the Campaigns page, click the drop-down menu next to your paused ad, and click Unpause. If your paused ad reaches its scheduled end date before you resume it, we'll be unable to reactivate the ad. Please wait 72 hours after your ad's end date to receive ad credits for your unused budget. Although you won't be able to run the same ad again, you can make an exact copy. To do this, go to the Campaigns page, click the drop-down menu next to your ad, and click Replicate. To permanently stop an ad from running, cancel it. After your ad is canceled, please allow us 72 hours to send you an ad credit for any remaining unspent budget. To cancel an ad, follow these steps. Click the drop-down menu next to the ad you want to work with, and choose End. In the Are you sure? 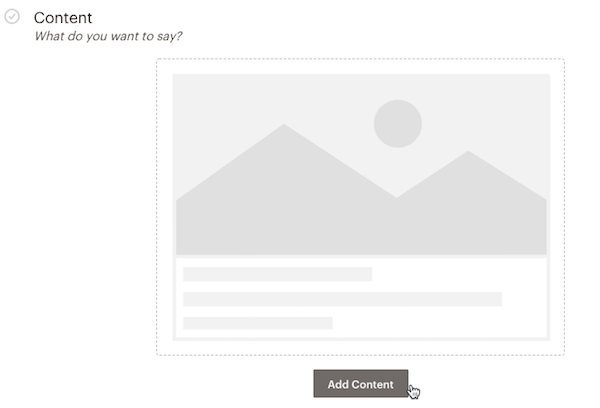 pop-up modal, type END CAMPAIGN to confirm, and click End Campaign. Congrats on creating your ad! Here are some additional resources to help you interpret results, resolve errors, and make the most out of ads. 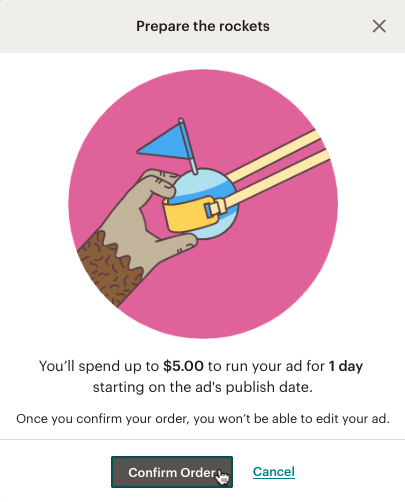 Learn about the billing process for Facebook and Instagram ads sent through Mailchimp, including budgeting and credit info. 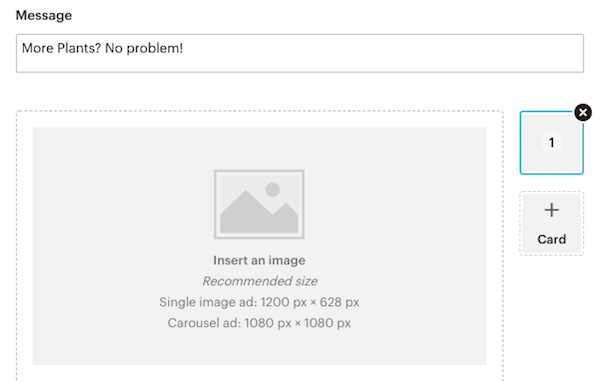 Learn how to design a Facebook or Instagram ad with Mailchimp's Ad Builder, and avoid common design flaws that cause ad rejections.